Welcome to the first article in the Dual series! As Robert Frost lamented in After Apple Picking, we often have more projects and plans for ourselves than we will ever have time to finish (or even start!). There are so many topics I want to write about that it is challenging to narrow my focus down to just one. So I did what other writers and thinkers have advised me to do: assign yourself something. Dual explores a topic and two elements within it. They may oppose, they may align, but they are bound together in the same theme. Dual is published on the second Sunday of every month. My first project is to look at embroidery: its history, its practitioners, its modern-day cousins, and its diverse applications throughout the world. In my personal illustrations, I've felt a recent fascination with Bedouin tribes and life in the deserts of the Arabian peninsula and North Africa, as well as the theme of "thread". Threads bind together our clothing, make up our clothing, and embellish it. Metaphorically, they weave through our lives, connecting people and events together in a tapestry of life. Embroidery, weaving, and other textile arts have traditionally been the work of women. At once the practice of threadwork can be seen as representative of domestic duties, domestic entrapment, revered artwork, a record of cultural symbols, a space for communication between women, female control over cultural values, influence over the inner sphere of family life, generational connection, busy work, a pillar of female virtue, etc. We can view threadwork through all of these lenses and never paint the full picture. Ancient textile work, when it survives, is a valuable record of the clothing, work, values, and lifestyle of ethnic groups throughout history. In nomadic cultures, many of these symbols and lifestyles remained nearly unchanged today. What excites me about textile art is its thriving in the modern day: from traditional societies to Western societies, from hand-made work to mass-produced output, from old to young, from ritual to innovation. For this first part of the Dual: Threads series, I explore the textiles of the Middle Eastern world. I can in no way speak for the vast groups within the Arabian peninsula, North Africa, and beyond, nor is that my goal. I hope to see through and open a window in reverence and curiosity for the beautiful work of people weaving threads into creation. The Bedouin (also Beduin, Badawi, Badw) are Arabic-speaking nomadic peoples of the Middle Eastern deserts, especially from the Arabian Peninsula and North Africa. The majority are animal herders and are organized by tribal and patriarchal structures. Their nomadic lifestyle has been threatened for the past one-hundred-plus years, as they've submitted to government control over their land and in their inter-tribal affairs. The traditional ways of life and roles of men and women are at conflict with the loss of their ancestral lands and influence of Westernization, urbanization, and technology. The Bedouin societies are complex, most famously depicted in the West in Lawrence of Arabia, an adventure story and dramatized account of T.E. Lawrence in Jordan. This epic drama is thrilling to watch but paints the tribes and workings of the desert societies in a one-sided way. You can read more about Lawrence's true(er) story here. What I would suggest, to understand more about these people, is to watch and absorb videos about them, starting here. If you'd like a more scholarly article specifically about women in Bedouin society, I would recommend this. This fantastic short documentary features a Bedouin women's association in Negev, Israel. This film is an insight into embroidery as a cultural practice, an almost sacred one, that brings women together. The group hopes to gain more independence and financial security within the larger patriarchal system. It is important to this head of the women's group that women feel independent and respected, working within their roles "Today, I see the change and that our goals were fulfilled. I see our women in the village much more independent, compared to the situation ten or fifteen years ago. Then we had only seven women in university. Today we have 480." "Our aim with the embroidery is to reduce the rate of unemployment among the women and to conserve the tradition. We started with what Bedouin women know best and believed embroidery was a way to start the change." The video ends with the story of the videos title "Bedouin Women Embroider their Dreams." A group of 11 women embroidered their dreams, past and present, onto cloth, taking artistic inspiration from their surroundings and their lives. I'm heartened at this project for women to both continue to value their culture through embroidery while working toward a less-restricted, less-submissive role within their tribe. You can support their mission and view their rich and fastidious work here on their website. Bedouin needlework is so prized that the same group, Desert Embroidery, was recently involved in a controversy over an Israeli designer who used their work for New York Fashion Week. You can read about the incident here. While there are countless women weaving and stitching, left unnoticed and unturned by the world's eye, a few contemporary artists draw us to witness the intricacy of traditional art, but with modern twists and timeless messages. 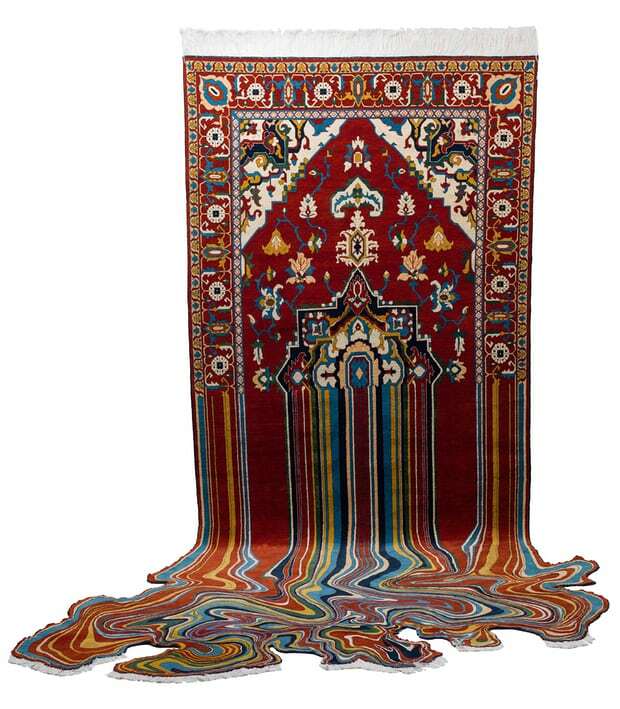 Faig Ahmed is one such artist, born in Baku, Azerbaijan. I discovered his work through an article on The Guardian, that describes his unique process and approach to textile art. His carpets seem to melt and pixelate before your eyes, combining the old and new patterns together, highlighting the transition of the artist, the time he grew up in, and his country as a whole. In the article he mentions the turbulence of growing up in Baku in the 1990s, when the USSR was collapsing. The article describes his work as a mixture of two worlds, as he "relentlessly throws settled structures into chaos, and explores how the two ideas live together." "I am in love with textile. Because fabrics are objects that humanity is using from the beginning of times, till nowadays. Another thing that interests me is pattern. Patterns and ornaments can be found in all cultures, sometimes similar, sometimes very different. I consider them words and phrases that can be read and translated to a language we understand.My art is an experiment. I want to examine the subject matter to see how deep can we go inside something accomplished and holistic and to observe the influence this kind of a change can have on people." Mona Hatoum with Inaash, 12 Windows, 2012-13. In searching for more material, I happened upon this excellent tumblr of contemporary Palestinian art. There I found a collaboration between Mona Hatoum, a video and performance artist born in Beirut to a Palestinian family, and Inaash, a Lebanese NGO founded to preserve traditional Palestinian embroidery and provide financial security to refugee families. in 2012-2013, a piece was created combining 12 pieces on Palestinian embroidery. The description from this website reads: "The act of embroidery functions as an act of resistance against the discontinuities of exile. Each ‘window’ represents, through its motifs, stitches, colors and patterns, a key region of Palestine. Pinned to a cable which crisscrosses the space, the embroideries and clothe pins evoke images of everyday life even as the cable dissects and disrupts the exhibition space, creating a metaphor for a divided territory." Textile weaving occurs everyday, in every corner of the Middle Eastern world; from Jordan to Turkey, Egypt to Afghanistan, Palestine to Azerbaijan. Most of its practitioners are not seen as artists in our contemporary view of the word and what it entails. They practice it as a part of their daily lives, as a way to communicate with other women, as a way of preserving the past, as a way of bringing more financial security and even more independence within the strict hierarchies of their lives. Another group of embroiderers who caught my eye are the women of the Wakhan Corridor in Afghanistan. This area is one of the most remote in the world, with harsh landscapes, isolated by mountains and under constant threat of war. The women there are distinct in Afghanistan, as they do not cover their faces and wear colorful scarves, showing the variations of their ethnic tribes. The small tourism industry brings some income to these weaving women, another thread in the fabric of an otherworldly place. In trying to highlight the weavers, sewers, and embroiderers of these lands, I feel I've barely scratched the surface, I've only threaded the needle. I would need extensive history lessons and a deeper understanding of regional politics to begin to understand the place of this practice in each society. The world of embroidery is more than likely the world of women. It's prevalence is everywhere, but hidden in the folds of the everyday. Threadwork is telling of who we are and what we value. - Written by Alex Ferel. 2018.